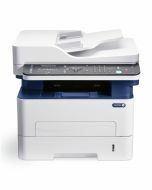 Designed to support the needs of a single user or small team, the WorkCentre 3225 streamlines your business operation by combining print, copy, scan, fax and email functions into one space saving device. Print speeds up to 29 pages/minute and copy speeds as fast as 10 seconds mean you’ll spend less time at the device and more time focusing on your work. Automatic two-sided printing is standard for even more productivity. 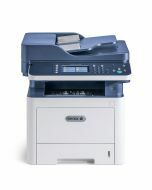 Crisp 4800 x 600 dpi enhanced image quality produces high caliber, professional documents highlighting outstanding print quality with sharp text and crisp graphics. Includes Ethernet, Wi-Fi and USB, enabling easy connection for one user or an entire work team. The Xerox® Easy Wireless Setup helps you connect quickly and easily to your Wi-Fi network. Now mobile phones, tablets and laptop computers can make a secure connection directly to the printer or multifunction printer even if you don’t have an existing wireless network. A wide array of features ensures that private data remains secure, including SNMPv3 and IPv6 network security protocols, and Secure Fax Receive, which holds a fax until an authorized user logs-in to retrieve it. 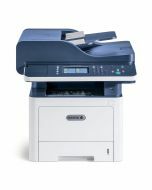 Colour and black-and-white scanning converts paper into electronic documents. Scan to Email enables sending paper documents directly to email recipients from the front panel –no need to walk back and forth from the multifunction printer to your computer. Reduce/enlarge, auto background suppression, 3-level darkness control, collation, ID card copy and N-up layout options give you the flexibility you need to complete your projects efficiently. Find your most-used functions fast with easy-to-read buttons and two-line LCD display. Print documents from an Apple® iPhone or iPad using the built-in support for Apple AirPrint™. Product Size Dimensions: (WxDxH) 15.8 x 14.3 x 14.4 in. Document Handler Automatic Document Feeder: 40 sheets, 5.8" x 5.8" to 8.5" x 14"